After its successful premiere at the boot trade fair in Dusseldorf at the start of the year, the VISION 46 has received an extremely positive response from both customers and the press. The next model in the new luxury sailing yacht collection is now under development. The new VISION 42 benefits from the same features and innovations as its big sister and will be available from this autumn. Both yachts from the high-end luxury line have an emphasis on comfort and design. In particular, the integrated lounge area in the cockpit and the generous amounts of space in the cabins make the new VISION 42 a luxury cruiser yacht with extra comfort for longer trips. BAVARIA’s latest model is the perfect yacht for owners with high expectations. Innovative features such as the new Dock and Trim Control, which was designed especially for BAVARIA, ensure that the VISION 42 has easy handling and great performance – whether sailing alone or with a larger crew. The VISION line from BAVARIA Yachtbau GmbH is a new luxury sailing yacht collection. It is the unique result of a Europewide series of workshops which involved customers in its development right from the outset. 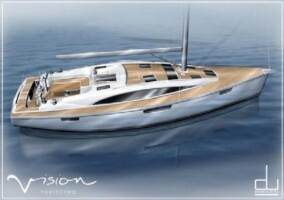 The VISION line was designed based on owners’ conceptions of their own dream yacht.